Skipper Ben Brown reflected on Sussex’s solid season and vowed the players would strive to make 2019 even better. Brown led the team to a third-place finish in division two of the county championship, one place short of promotion. He said there were plenty of positives, but they had to go one better next time. Brown told us there was pride at what they had achieved but a sense of ‘what might have been’ at missing out on a return to the top flight. “I think we’ve had a good season in all formats – we think the same about the Twenty20, where it was heartbreaking to miss out in the final. I really feel the same about the championship season. “We haven’t realistically challenged for a while now – we’ve been okay but we haven’t really challenged. “But I feel like this year it could have gone our way. Brown said the aim in the four-day game had to be to go the next step next season and make sure of promotion. Going up in 2019 could be easier, with three teams set to be promoted to a larger division one for 2020. “It’s on us now to improve again and not just sit back and think we’ve done enough. We’ve got to go and improve again,” he said. 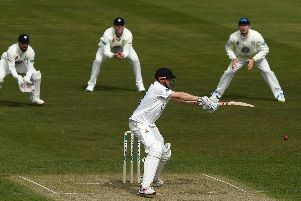 Brown was named skipper of the four-day team and the One-Day Cup 50-over side before the season began and said he’d thoroughly enjoyed leading the team and combining skipper’s duties with wicketkeeping and batting – and even three overs of bowling in the final home game against Warwickshire. “I’ve got a really good relationship with Dizzy (Gillespie) – I think we’re on the same page with regard to the direction of the club and how we’re going. Brown praised the contribution of the young players who’d broken into the side or become regulars this season, like Phil Salt, Harry Finch, Michael Burgess and Tom Haines, and he predicted a tough battle for a place in the starting XI in 2019.